Zara black suede fringed dress size L . Condition is Used. Dispatched with Royal Mail 1st Class. Worn once perfect condition. The dress is 26" long from underarm to hem. The dress has a crochet eyelash black fringe. It is machine washable. (18 20 22 - may fit these UK sizes. ). 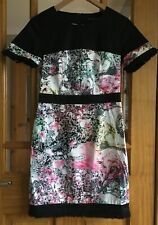 black river island dress size 10. Only worn once. Bottom of the dress has an underskirt which is then covered by sections of black chiffon material. Lace detail on back on sides of zip. Condition is Used. Dispatched with Royal Mail 1st Class. Ladies Pale Pink Cotton Dress/Top One Size. Fits a size 10/12 no bigger. Ruffles and Tassels Very pretty and easy to wear By its self or leggings looks great. I would call the colour Ashes of Roses. Condition is Used. Dispatched with Royal Mail 2nd Class. Boohoo black beach dress Neon Fringe Size 12 Short length. Condition is Used. Dispatched with Royal Mail 1st Class. Look stylish in this lovely little black dress from WHISTLES with crochet style design which is semi sheer at the top, frilled detail on the shoulders featuring fringed edge, tiered flared skirt and zip fastening on the back, great for parties or special occasions. Coachella Fringed Cream Dress - Missguided, Size 10 - Brand New with tags. Condition is New with tags. Dispatched with Royal Mail 1st Class. Unique Sweatheart Neckline Sleeveless Tutu Small Black Dress. Fabric: Thick Elastane. Fabric Stays In Shape As It Is Thick. Item Is Unique Modified. Looks Better Then In Photos. Looks amazing on!! New without tags - bought this as well as a red satin bodycon for my 21st birthday, but I went with the red dress. Selling due to me not having enough bust for this kind of dress, so its not something I can wear. Its only been tried on once, so in new condition. It's a beautiful dress which I'd have loved to keep and is currently advertised on Pretty Little Thing for £45 so this is a bargain!! I'm 5ft 6 and the dress fitted my height well There are adjustable straps on the dress Pretty Little Thing Emerald Green Sequin Lace Frill Hem Bodycon Dress UK Size 8. Nasty Gal ‘Wake Me Up Before You Go Go’ Black fringe mini dress with sweetheart neckline- used once. Very figure flattering and the fringe distracts from any ‘bumps’ if you know what I mean. There are no visible marks of defects. Size is large which is 14-16 on the website size guide. RRP £21 selling for over half price. pink boutique Glamarous Gold Sequin Fringe Dress. Condition is Used but has only been worn once - excellent condition. This is a stunning gold dress and it catches the light beautifully - it will add sparkle to any occasion. Dispatched with Royal Mail 1st Class. Condition is Used. This item isn’t fringed or two tone ! 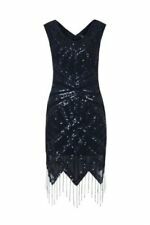 Julien Macdonald Black Flapper Fringe Dress With Embellished Neckline Size 12. Condition is Used. Dispatched with Royal Mail 1st Class. This dress is so gorgeous and perfect for the party season. XL UK 12/14. Lavish Alice Cobalt Blue Fringe Tassel Tuxedo Blazer Dress Size 10. Condition is New with tags. Dispatched with Royal Mail 1st Class. french connection 10 Sleevelss Mini Dress Black Fringing Cocktail Jazz Age. Condition is Used. Dispatched with Royal Mail 1st Class. Topshop Black Fringe Mini Dress. Size 10. Thin straps and racer style back. Gorgeous party dress. Used - Great condition though. Moda Minx White Fringe Dress Size XS. Condition is Used. Dispatched with Royal Mail 1st Class. ZARA NEW S/S 2019. DIVINE PRINTED DRESS WITH FRINGED DETAIL. REF 2115/410.